Rice shinpaku structure or not? Rice structure or not rice structure? Extending the review from last post with three more papers. Key to sake production is the shinpaku or white opaque center. The shinpaku is generally important because of its increased ability to gelatinize during steaming, has a softer center for koji to invade once it breaks through the firmer outer layer, and is more highly convertible by the koji enzymes. All of this is true no matter the milling rate. For these reasons much of the breeding of new rice varieties has involved attempts to improve the significance of the shinpaku. However, as ginjo and daiginjo become more important types of sake, high millability is also becoming more important. In particular, the papers analyze why some are better suited for high polishing levels while others are not. This characteristic is hugely important for ginjo and daiginjo styles of sake which have been on the rise in importance for some time now. This week I will look at three more articles on the same basic topic. However, before covering the additional papers, I would like to clear up a loose end from the last article. The papers discussed in the last article, discussed the characteristic type of shinpaku each varietal has. These characteristic types include: non-lined (I think no-shinpaku would be a better name), lined, bellied, dotted, and ellipsoidal. As I mentioned in the article I was not sure what was meant by lined. Actually, I was thinking that it was a dense shell around the shinpaku. However, this was wrong. The lead author on the three papers, Masahiko Tamaki, sent me some nice pictures that make it clear. I don’t have permission to post the pictures so I will attempt to provide a diagram that gets the information across. In the following diagram there are five characteristics represented with each having a side angle view of a rice kernel on the left and a cross section view looking down the long axis on the right. The first characteristic pattern, non-lined, represents rice without a significant shinpaku (white area in the center of the rice). Most eating rice has this characteristic. Next is the lined shinpaku which is the best structure for high milling levels. The bottom two bellied and ellipsoidal both have larger shinpaku but they are also more brittle. This gets in the way of milling and creates more broken rice. Dotted, is the final characteristic and is somewhere between non-lined and lined in terms of its suitability for high milling levels. The first of these three papers looks at differences between rice kernels with shinpaku and without where the kernels are of the same variety. Two varieties (Senbon nishiki, Yamada nishiki) were analyzed each of which were grown in three different areas of Hiroshima (Shobara, Takamiya, Miwa). 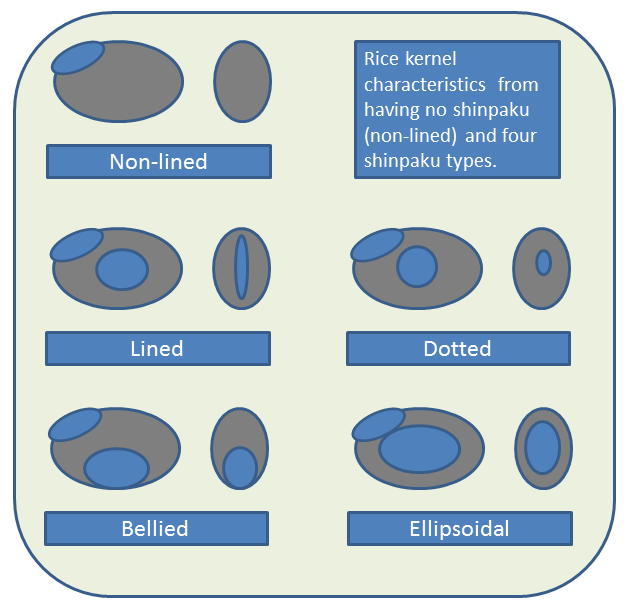 The hardness of the center of each type kernel was measured with no significant difference between the three plots but quite significant difference between the shinpaku and non-shinpaku kernels within the same type. Other locations, four more, were also tested with similar results. In addition, starch characteristics were analyzed finding again, no significant difference between the shinpaku and non-shinpaku kernels. Given all this the conclusion continues to be that the differences in the structure of endosperm cells are responsible for all the properties of the shinpaku. The second paper looks closer at the differences in hardness of the rice kernel and its shinpaku and their likelihood of breakage. They considered four types of rice: Kairyo omachi, Hattan nishiki No. 1, Senbon nishiki and Yamada nishiki. The first two of these have a significant higher breakage rate as compared to the second two. Very cool pictures taken with a Scanning Electron Microscope (SEM) show that Yamada and Senbon nishiki have much more tightly packed starch than does Kairyo Omachi and Hattan nishiki. This tight packing makes the rice harder and less susceptible to breakage. Paper three analyzes the same rice varieties as paper two but compares starch properties rather than hardness. This study suggests that the shinpaku tissue may also play a part as well as the temperature of the early ripening period. This is, of course, in addition to the endosperm structure’s demonstrated impact on millability. Author WillPosted on April 29, 2012 March 5, 2019 Categories Ingredients, RiceTags Rice, rice millability, rice shinpaku6 Comments on Rice shinpaku structure or not? This week I thought that it would be interesting to look at the rice production in the US. This quick look will actually be narrower than the whole of the US in that I am using material exclusively from the Sacramento Valley in California. However, many of the themes will be true for the US and are in stark contrast to what we often see related to rice for sake, our primary interest. I have been watching the youtube channel RiceNews for a couple of years now and find it to be very interesting. All of the videos here have been selected from their offerings. While the rice farming families in the US can’t go as far back as those of Japan can, many of those in the Sacramento Valley go back to the beginning of California production. New US kura, the “Texas Sake Company” grand opening on Nihonshu no hi! Using a strain of organic Texas rice that is said to have a heritage that traces its roots back to rice from a Japanese delegation that came through Texas in 1904, The Texas Sake Company will specialize in local organic ingredients. Yoed Anis, the founder and Toji of Texas Sake is truly excited about using Texas grown rice with roots that go back to Japan. Texas Sake has actually been operating for some time while getting ready for the grand opening, October 1, 2011. They began at least as early as February to produce test batches of sake which they gave away to their followers in Texas; a nice way to build the following. Their grand opening is being held at the brewery: 5501 N Lamar Blvd, A115, Austin, Texas. It is wonderful to see a new kura starting up; welcome Texas Sake Company. Author WillPosted on October 1, 2011 March 10, 2019 Categories General Topics, Ingredients, RiceTags New Kura, New US Kura, sake breweryLeave a comment on New US kura, the “Texas Sake Company” grand opening on Nihonshu no hi! I have meant to post a little something about anazake for some time but I keep putting it off. Now that I have gotten a question about how to make it I can see that it is overdue and I should get my act together. Amazake is a rice and koji mixture that is most thought of as a drink but has other uses as well. OK, so to make amazake you need koji and rice. You can make koji with the method discussed in the earlier post, “Making Koji for Sake.” In this case you will need to start with koji-kin. If you prefer you can skip making your own and just buy the koji. I have both koji and koji-kin in the store. Back in August I posted an article about milling rice with the TwinBird Rice Mill. However, I was not able to include any pictures that could prove useful to those of a mind to construct their own mill. I committed to doing so and I now have the needed pictures. As we shall see this arrangement seems like it can point the way to a very workable small rice mill that would handle, say, 20 lbs. of rice. Anyway, let’s take a close look at this baby. 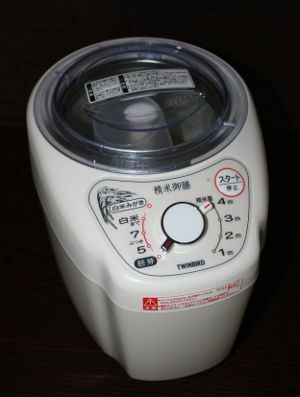 The TwinBrid mill is designed to run in the kitchens of Japan, handles 4 go (180ml) of rice at a time and runs on 100 Volts, 150Watts at 50-60 cycles. This makes it a good fit for US kitchens as well. The picture below shows the mill and its control panel. The left side is used to indicate the starting state of the rice to be milled, from white rice at the top to brown rice at the bottom. The right side is used to indicate the level of milling desired. Given this, I believe the setting shown gives the longest mill time setting.